GoPro cameras have been used to film the exploits of humans for years. Now, it's time to turn the camera over to man's best friend as GoPro recently released a harness with mounts for our furry four-legged pals. The Fetch dog harness features two mount location for Hero cameras: one on the back for over-the-head shots and another on the chest for ground-level views. The harness is fully adjustable with GoPro telling us it'll fit most dogs ranging in weight from 15 pounds up to 120 pounds. The lower mount can even be removed so it doesn't drag the ground when worn by short-legged canines. The harness can be machine or hand-washed - a good thing since it'll likely get pretty dirty and smelly during use. When a camera is in an appropriate housing, users shouldn't have to worry about mud, snow, water and other outdoor elements. Potential use scenarios are limitless really. I imagine one could get some pretty sweet footage of a canine playing fetch, catching a Frisbee, diving into a lake for a quick cool down or even hanging out with other pooches at the local dog park. Call me crazy but I could see this being a solid product for use in K9 law enforcement as well. 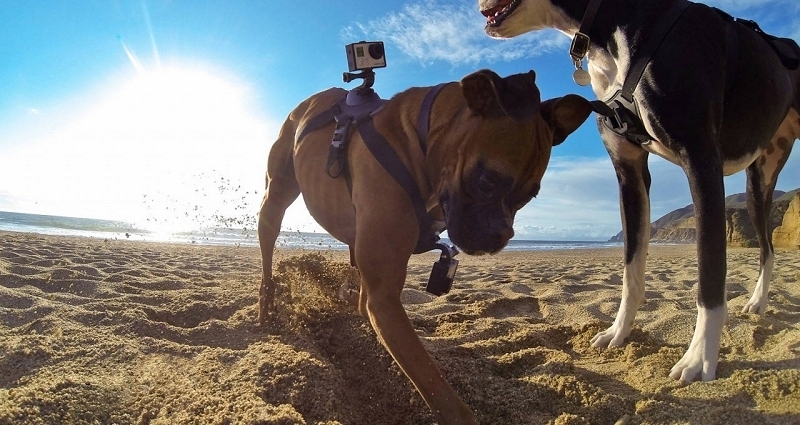 The GoPro Fetch harness is available as of writing for $59.99 on the company's website and at select retailers.